ITEM G409254M20 - 9" x 240"
9" x 240"	9" x 288"
Sizes (Width x Length) 9" x 240"; 9" x 288" 9" x 240"; 9" x 288"
Plank Grating facilitates secure footing on rooftop walkways, catwalks, stairs, and other surface applications when safety is critical. The product line is lightweight and easy to cut and fabricate. 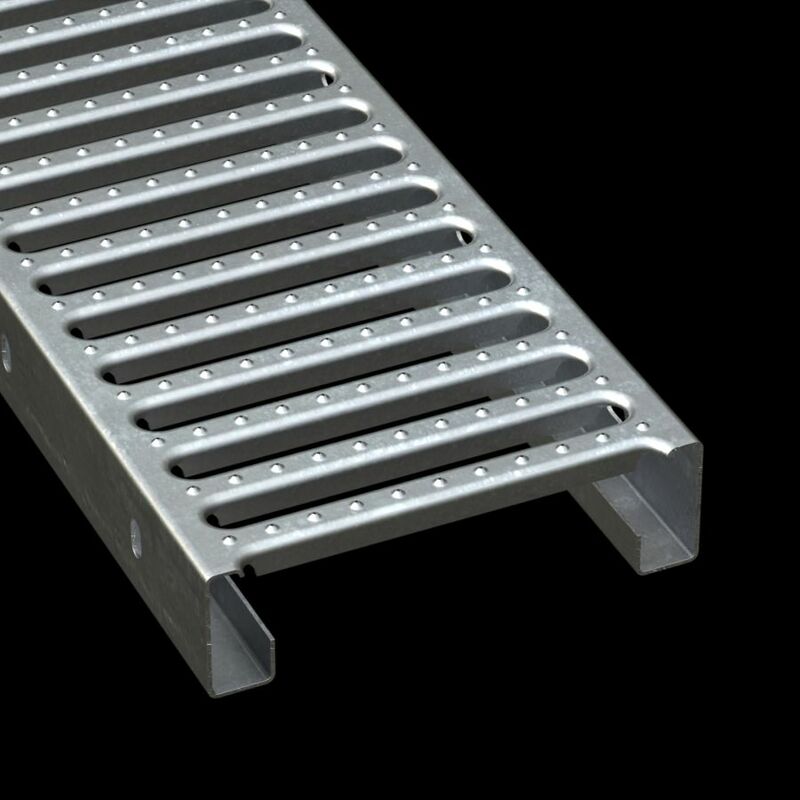 Made by forming and punching metal, McNICHOLS® Plank Grating comes in a variety of materials including Aluminum, Carbon Steel, Galvanized Steel, and Stainless Steel. Different construction types consist of Plank, Walkway (both with Heavy-Duty options), Interlocking, Extruded Interlocking, and Heavy-Duty Plank. Additional construction types consist of several Ladder Rung Plank styles, as well as Stair Tread Plank Grating options. An array of heights, widths, surface profiles, thicknesses, and more are all part of our complete line of Plank Grating Hole Products! Consider Plank Grating uses and physical requirements for your interior or exterior application. Loading, span and support needs as well as traffic requirements such as pedestrian or hand cart are important considerations. Several Plank Grating products comply with the Americans with Disabilities Act (ADA) when installed to written standards. We invite you to browse Plank Grating applications in our Gallery. Choose from a wide variety of Plank constructions types including Plank, Walkway, Heavy-Duty Plank, HeavyDuty Walkway, Interlocking Plank, Extruded Interlocking Plank and Heavy-Duty Extruded Plank. Determine the series type and name (GRIP STRUT® Walkway, PERF-O GRIP® Plank, etc.) of the Plank Grating product for your project. Items that comply with the Americans with Disabilities Act (ADA) standard will have this language indicated in the item description of the applicable products. Select the primary material type including Aluminum, Carbon Steel, Pre-Galvanized Steel, or Stainless Steel. Inventory is typically "mill finish" unless otherwise specified. We provide more information on Primary Material Types and Product Finishes in the links provided in the Overview section of the Plank Grating Resources landing page. Decide what material gauge number or thickness in inches is right for your project. Extruded products do not have an actual gauge number due to the manufacturing process. These items are specified as an Extrusion. Select the channel depth or height for your surface profile selection. The channel size for Plank products is referred to as depth. For Walkway products, the channel size is referred to as height because of its upturned profile above the surface of the product. Choose the percentage of open area desired in your Plank Grating construction type selection. Choose the direction the openings need to run in your surface profile selection. Surface profile direction is often referred to as span. Clear span refers to the distance in-between Plank Grating supports and is an important installation consideration. Identify the number of Planks or other forms (width and length) needed as well as specific sizes (cut-to-size pieces, areas, Stair Treads, etc.). Areas exceeding standard Plank widths are provided in multiple pieces to width. Specify any requirements like fabrication, notching, cut-outs, Stair Treads, non-standard tolerances, etc. Determine if Plank Grating Accessories like Clips or Fasteners/Hardware, Splice Plate Kits, etc. are needed for your project or application. View McNICHOLS® Plank Grating Resources on tolerances, finishes, available sizes, and more! Helpful McNICHOLS® Plank Grating load tables to save, print, or share! Sizes (Width x Length) 9" x 240"; 9" x 288"